I started a business in 1987 called Mobile Bright. The objective of this company was to clean the exterior of mobile homes. When I marketed Mobile Bright, I offered windows to be cleaned free with a washing of their mobile homes. The funny thing is that people would call me and say "I don't need my mobile washed but rather, would you please wash my windows"? "Wow" I thought, this is where I need to be focusing my attention. So at that time the birth of 20/20 Window Cleaning came into existence. 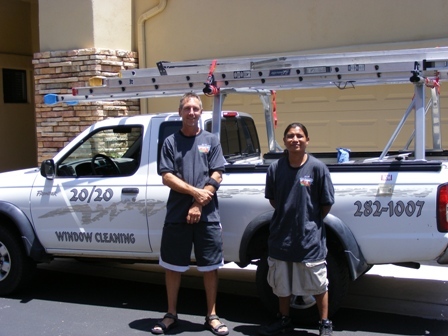 In the year 2000, 20/20 Window Cleaning incorporated and flourished into the most trusted name in the Verde Valley. 20/20 Window Cleaning is a fully insured professional window cleaning company that offers a wide range of services, with window cleaning being the primary focus of our company. Our main goal is 100% customer satisfaction. We will provide you with the best service the window cleaning industry has to offer, at a price that will meet or beat our competitors. If you are not satisfied with any of our cleaning services we will do it again and again until you are completely satisfied. We specialize in residential, commercial, new construction, and industrial window cleaning. There is not one job that we have failed to do, and the important thing, to do it right. No matter how large, difficult, or no matter how small, we will get the job done right. Our services can be done weekly, monthly, quarterly, semi annually, annually, or even just a one time service. We do all of our work on appointment only basis, so you can be rest assured that we will be there when you need us.